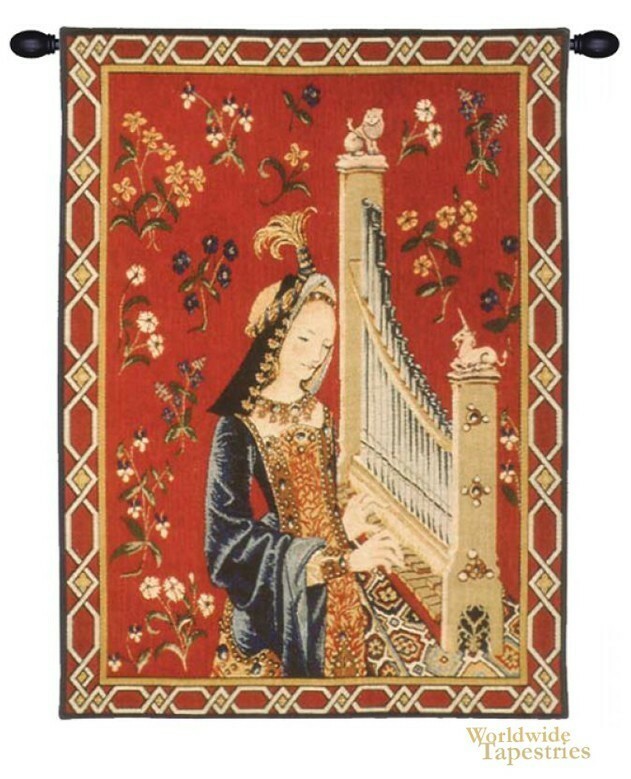 Another in the series known as “La Dame a la Licorne”, this tapestry depicts the sense of hearing. It shows a lovely maiden from the 1500s playing a pipe organ. She is surrounded by bouquets of flowers, typical of the Mille Fleur style that was so popular during the medieval period. Woven in 16th century Flanders, the complete series of tapestries were commissioned to celebrate Jean Le Viste’s appointment to King Louis XI’s court. Each tapestry was exquisitely designed and woven by the expert weavers in the workshops around Flanders. After Jean’s death, the series was passed to his daughter, Claude. When she died without producing an heir, the set was split up among other family members. Today, the series has been reunited and is on display at the Musee National du Moyen Age in Paris. This delightful Hearing (L'Ouie) Detail tapestry is lined on the back and has a tunnel for easy hanging. Note: tapestry rod and tassels, where pictured, are purchased separately. Dimensions: W 19" x H 26"